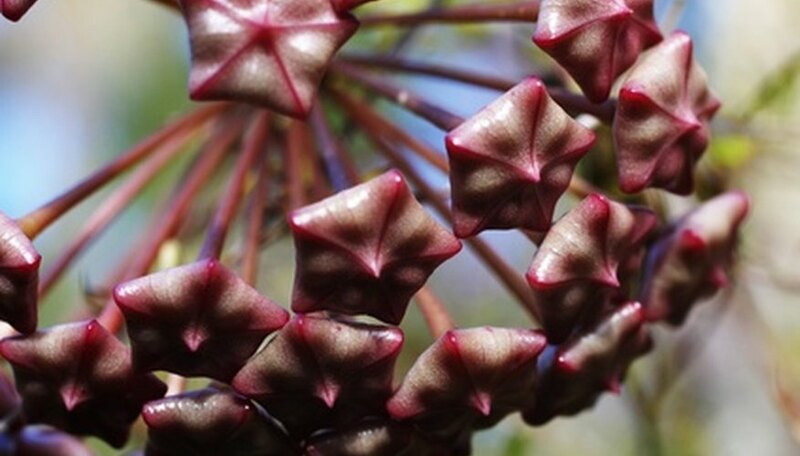 Hoya carnosa compacta, or the Hindu rope plant, is an attractive, slow-growing vining tropical native of Australia and Eastern Asia. These tough, resilient house plants manage to adapt to many different indoor living environments. The shiny leaves cup, twist and contort themselves, giving each vine a rope-like appearance. Healthy rope plants produce waxy, fragrant spring or summer bloom clusters by their fourth or fifth years. Practically care-free once established, the long-lived Hindu rope plant’s exotic appearance belies the fact that it is also remarkably undemanding. Situate your Hindu rope plant where it will receive plenty of bright indirect or curtain-filtered light. A spot close to a window with direct morning or evening sun is a good choice. Ideally the plant needs about four hours of sun daily, but it won’t tolerate excessively hot exposures in Southern regions. Provide a warm environment for your tropical rope plant. It will thrive best with a daytime temperature above 70 degrees Fahrenheit and a nighttime range of no lower than 50 to 65 degrees Fahrenheit. Scatter some pebbles or gravel on the bottom of a small shallow dish and cover them halfway with water. Set the potted hoya on the stones, making sure that the pot does not come into contact with the water. These plants require nearly 100 percent humidity year-round, particularly when grown indoors. Set the hoya in the sink. Soak it slowly and thoroughly the first time you water. Allow it to drain freely for several hours until the soil surface is evenly moist, not drenched. Thereafter water only enough to keep the soil surface barely moist, but never soggy or wet, throughout the growing season. Feed your Hindu rope plant an all-purpose liquid house plant fertilizer monthly throughout the growing season. Hoyas are light feeders, but they benefit from a regular feeding schedule. Prune the plant only when absolutely necessary. Pinch off yellowed, brown or dead leaves if they occur to keep the plant looking tidy and attractive. Do not remove flower stalks following blooming because these stubs will continue to bloom. Rope hoya flowers do not require deadheading. Water lightly during the fall and winter months, and allow the Hindu rope plant’s soil to become almost dry between waterings. These plants are succulents, and their fleshy leaves allow them to tolerate short dry periods. If the leaves begin to shrivel, water the soil so that it feels barely moist to your touch. Stop fertilizing at the end of the growing season as the Hindu rope plant prepares to rest for the winter. Do not allow the temperature to drop below 45 degrees Fahrenheit. Repot only very rootbound hoyas in the spring. The Hindu rope plant seems to like being crowded, and highly resents being disturbed by transplanting efforts. Hindu rope plants take a long time to recover from such an ordeal. If your Hindu rope plant produces an abundance of dark green leaves but no blooms emerge, the plant is probably not getting enough light. Your rope hoya can survive short periods of drought better than it can tolerate wet feet, as long as it receives plenty of humidity. Err on the side of slightly dry if you are in doubt about watering this plant.